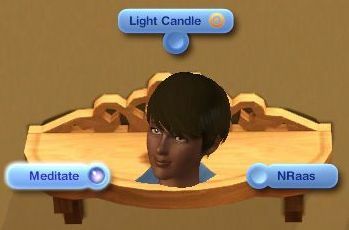 This is a pure script mod that adds a "Meditate" interaction to all candles, including the Mood Lite candle (Base Game). This mod does not require any expansion packs, only The Sims 3 base game. This mod was built with patch 1.42 and may not be compatible with any lower patch level. Check for updates to this mod after major patches. This is a pure script mod and has little to no chance of ever conflicting with any other mod. 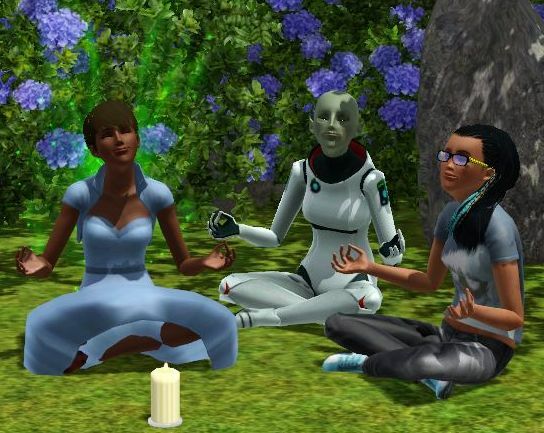 If you are using NRaas Vector, your sims can meditate with this mod to increase resistance to certain diseases. This is a base game candle. Can be used on all surfaces except pedestals and display cases. Applies to candles already in game. No need to re-purchase. Also added to all custom content candles. NEW: Added to all IncenseHolder objects. This interaction is only available to teens and above. You can alter the MeditativeCandle_Meditate_GameObject ITUN to allow children to meditate, but the child will stretch while meditating. If the interaction is completed successfully, Witches, Fairies and Genies will have 100% of their powers restored. 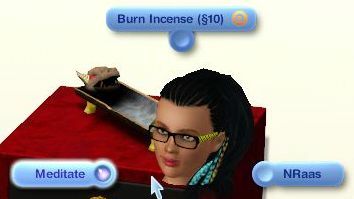 Sims receive a moodlet when successfully completing the interaction. Advertisement on the interaction is low, to prevent sims from spamming it too much. This interaction does not count for the Martial Arts Master of Meditation skill challenge. 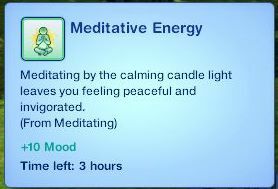 Witches will gain the Spellcasting skill (from Supernatural) at a slightly faster rate while they have the Meditative Energy moodlet. You can tune the multiplier by altering the BuffCandleEnergy XML in the Nona_CandleMeditate.package. To disable the multiplier entirely, set the value for kSpellCastingSkillGainModifier to 1 in the BuffCandleEnergy XML. Additional Credits: Zedrael for being my guinea pig. Inge & Peter Jones for helping me with the NGMP stuff. misu for sharing what she knwos about NGMPs, too. cmo because he is so smart and figured I messed up my clips without me having to say anything. orangemittens for the encouragement. blue, shimrod and tessa for some feedback about mod types. caterpillar for her feedback on skill gain modifiers, and everyone else in Simlogical chat. Thanks, guys!